I wanted to do something a little different today. I know lots of bloggers do the "Day in the Life" posts a few times a year and although Lacey has done a few about being a Flight Attendant, I've never done one. 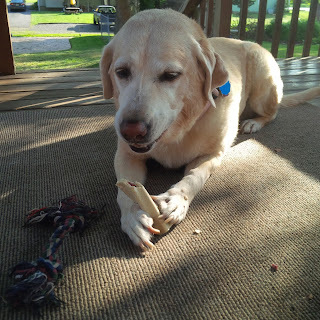 Yesterday was my sweet girl's birthday. She is 10! Yes this makes me so sad but I am also so grateful that we have had her for 10 years. I admit this post is probably more just for me as a way to commemorate this time. 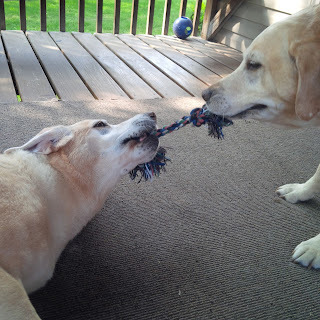 Although some days are full of playing in the park, swimming, long walks, vet visits, shopping with mama, and play dates with Belle, this post just shows an ordinary day with Baylee. This is exactly how our days starts. 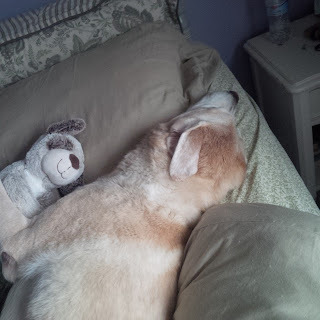 Some days she actually lays her whole body on my pillow and wraps her neck around my head, She sure is a cuddly dog, which makes it hard to want to get out of bed some days. 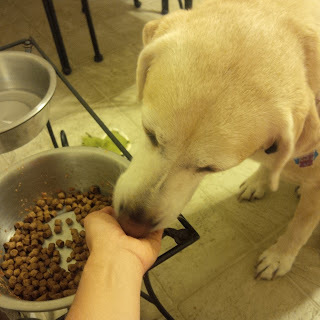 There are days when I still have to feed her by hand. This has been a thing since her brother passed back in August. I don't know if it's just a way for her to make sure I am spending time with her or what. Now here comes the sad part. 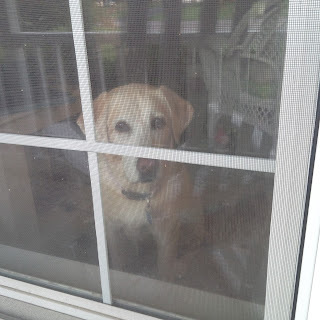 This is the look I get when I leave for the gym or for work. And then she rushes to the window so she can see me leave the driveway. 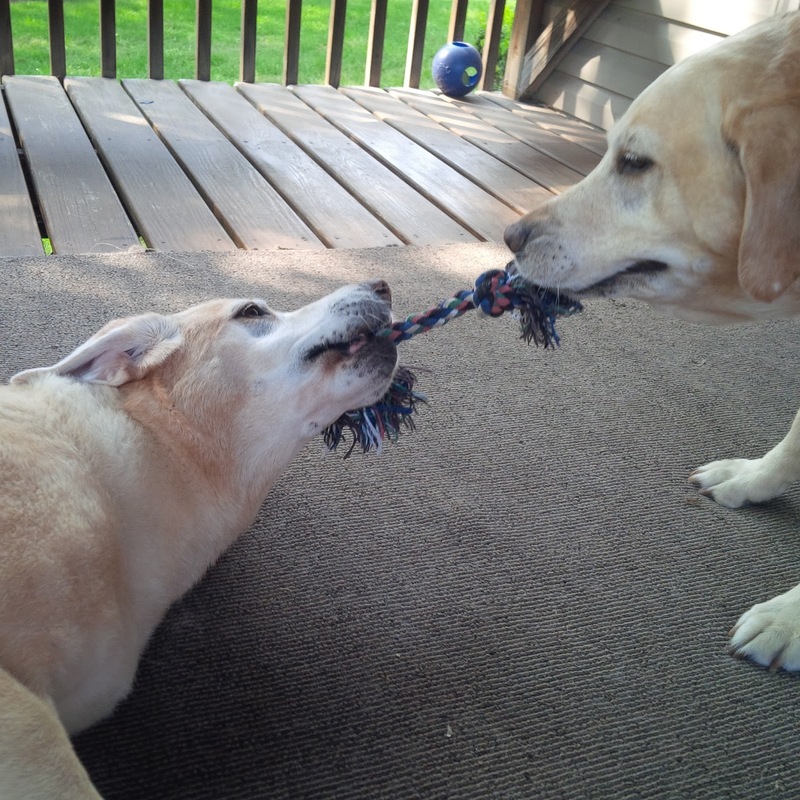 On days that I work, Lacey takes Baylee to play with Belle. They have great fun. And Pappy spoils her with Busy Bones! When I am done with what I need to do, I pick her up and drive her back to our home. 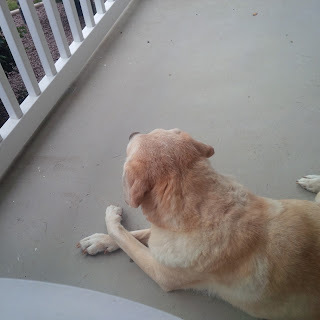 She likes when we spend some time outside on the porch together. She loves just sitting beside my rocking chair. Notice how she sits with her paws crossed? She does this all the time when she lays down. 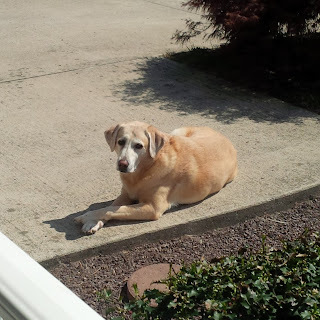 Here she is again laying pretty with her little paws crossed. After some play time and round two of eating, it's time for relaxing and belly rubs! She recently got a new dog bed but eventually she always ends up on the furniture with us. And that's okay! When you have a Labrador you quickly learn that you have very little time to yourself. She knows when it's shower time and she will sit in front of the tub until I am finished. if for some strange reason I am able to sneak in the shower with out her knowing, she quickly comes running up the steps and pushes open the door as soon as she hears the water start running. While I'm getting ready for bed, Baylee is already making herself comfortable in my spot. She even carries her little puppy bear ( I can't decide which it is yet) to bed with her. 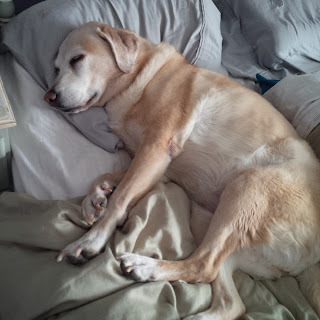 I of course slide in beside her and let myself be uncomfortable for an hour or so until she decides to roll over or lay at the end of the bed like a normal dog. 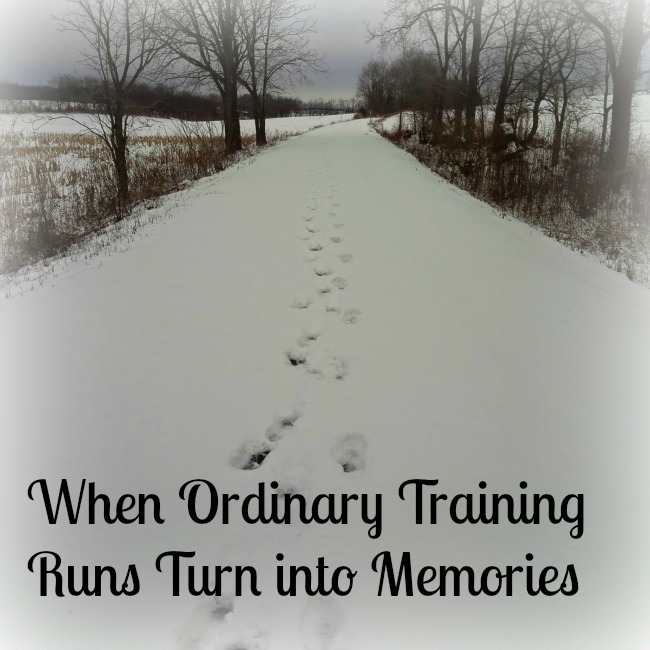 Last week we talked about some memorable every day ordinary training runs. I mentioned that one of my favorites was doing a training run while we were finishing up the #RunChatHunt. What made that run special was that while we were out running and searching for Christmas items, we were listening to Christmas music on our ipods. Each year our local radio station starts playing non-stop Christmas music from Black Friday till Christmas. Last year, it started earlier than Black Friday, and this year, it started on November 16th! I like Christmas music but just out of respect for the Thanksgiving holiday, I think the music needs to wait till after Thanksgiving. 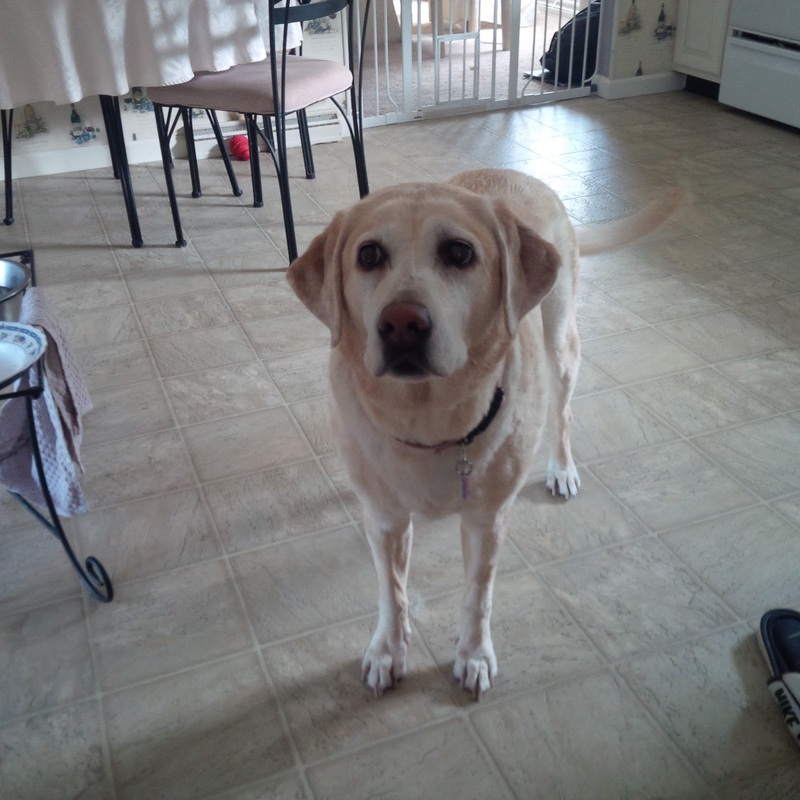 Lacey stopping during our run (last year) to take a picture for the #RunChatHunt. 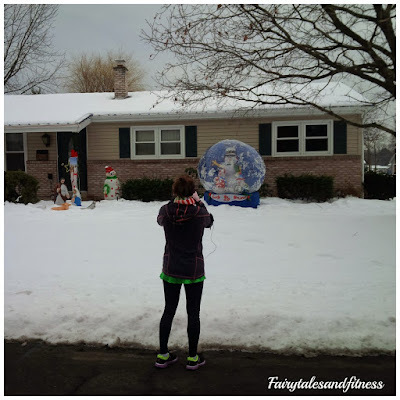 In any case, we will be participating in the #RunChatHunt again this season and we will no doubt be listening to Christmas music while we do it. That's not the only time I want to listen to Christmas music though. 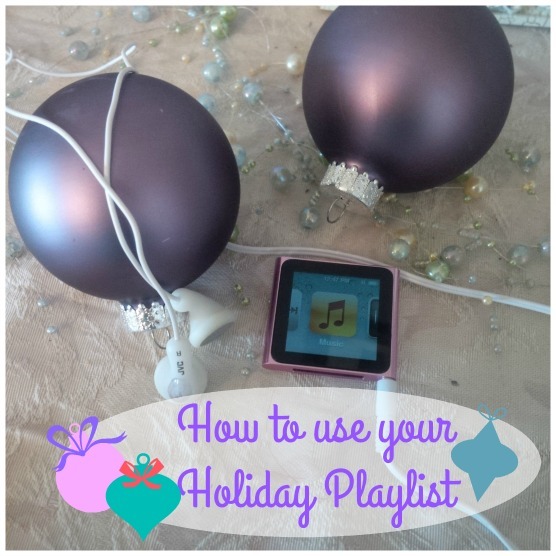 I thought it might be fun to create an "up beat" Christmas music playlist for some of my runs on the trail. Here are some upbeat Christmas favorites! 4. Rockin Around the Christmas Tree -Brenda Lee ( This song always reminds me of the movie Home Alone, as does the song Run Run Rudolph. Both are sure to be on the running playlist). Although not really meant to be a Christmas song, I'll be adding Seasons of Love (525,600 minutes) from the Musical Rent. It just seems so fitting this time of year. Random Trivia Fact: Seeing Rent on Broadway was one of the first dates Scott took me on. And although not all that up beat, I'll be adding Happy Christmas (War is Over) by John Lennon. That is my absolute favorite Christmas song. P.S If you signed up for the Holiday Card swap you should have received your secret blogger. If you did not, please let us know. 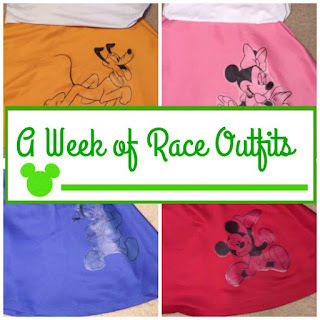 This time of year many Disney runners are working on (or finished with) their race day outfits. Afterall, that is one of the things that makes Disney races so unique. In the past we have never gone with a full out costume but we do add some Disney touches to our race outfit. I have to admit that even though I have been thinking about our race attire for several months now, I haven't actually started putting them together. I have the ideas in my head though. I have one skirt bought and that's all. My sister and I will be both running so that's double the outfits. 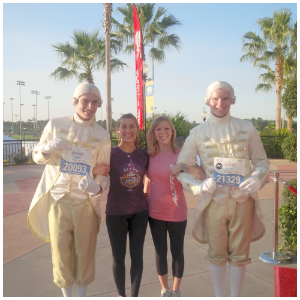 Unlike myself, my friend Heather knew exactly what she wanted as her race outfits for the Dopey Challenge. She knew I enjoyed designing outfits so she consulted with me and I created a little something for her. 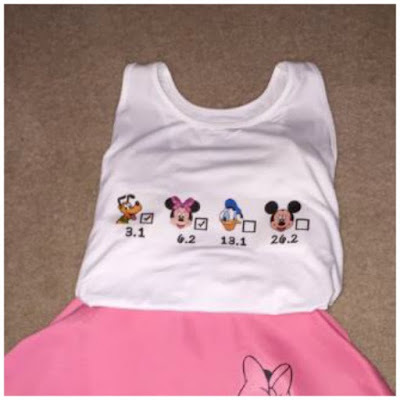 I made the design and she printed it on four different shirts ( one for each day of the Dopey Challenge). Each Race she completes will have a check mark in that box. So essential each day's shirt will look the same but will have more checked boxes off. 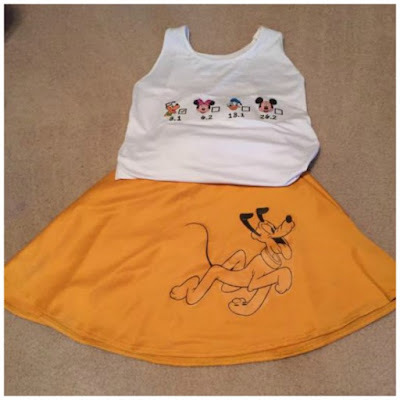 She even printed up skirts to match the theme of each race. The 5K is of course "Pluto" themed so a Pluto skirt seemed perfect! I absolutely love what she did. Isn't she clever? Okay, I suppose I need to go work on our outfits now. 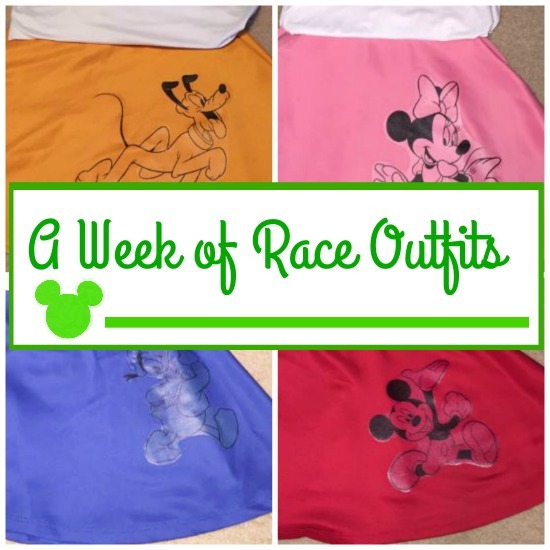 Do you have you outfit planned for your next "themed" race? 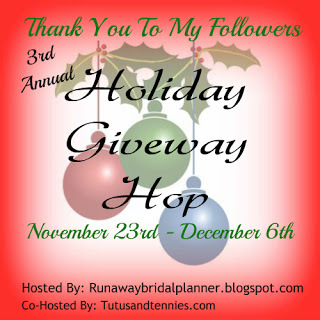 Thank you for checking us out today and seeing what we have to giveaway for the annual Giveaway hop hosted by Runaway Bridal Planner. 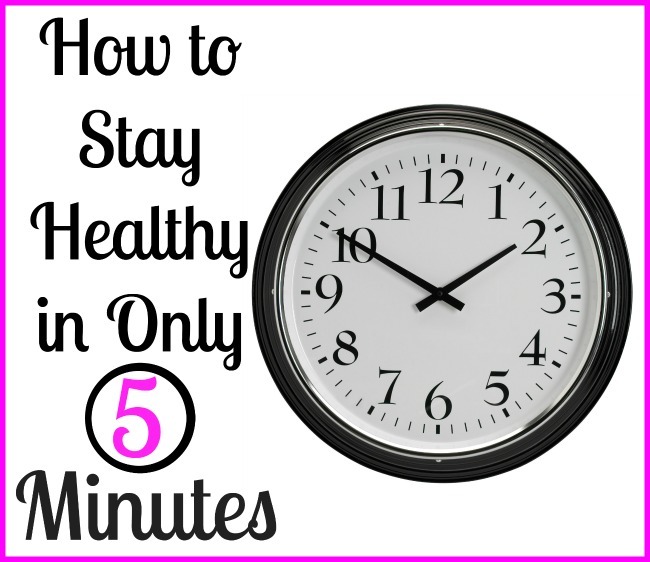 We are also linking up with the Tuesdays on the Run gals for their holiday gift guide! We thought long and hard about what we wanted to give away to our readers. 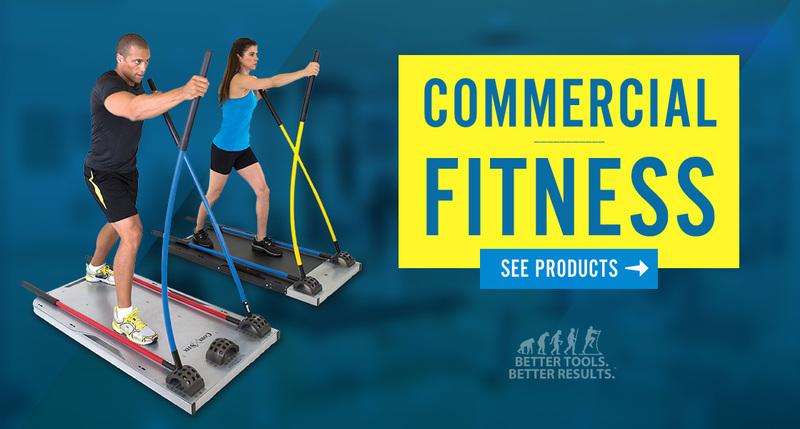 We wanted to let you pamper yourself yet still have it be fitness related. What we came up with was a Gift Package from Aurorae! 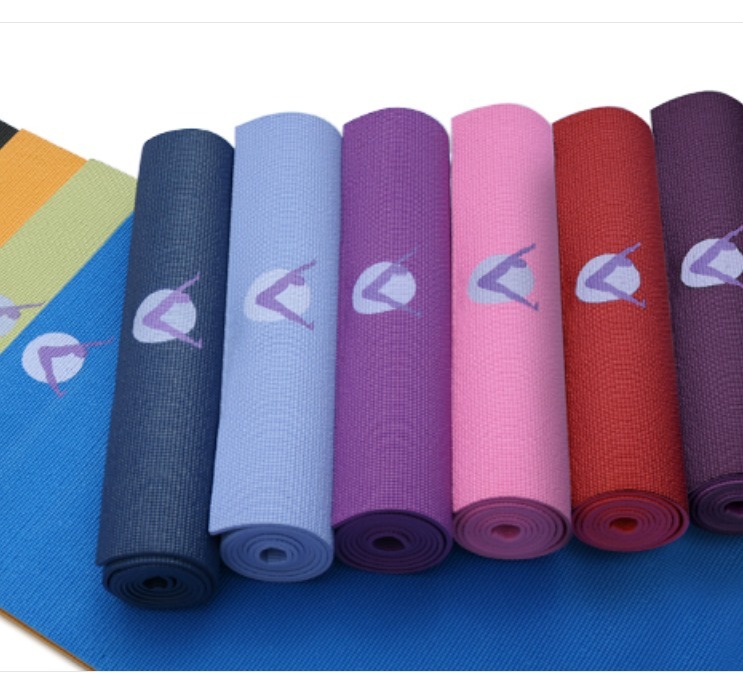 Aurorae is a lifestyle brand focused around yoga and wellness. It was founded by a yoga student who is also a cancer survivor. 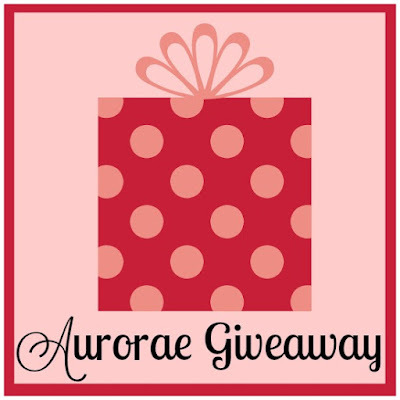 Aurora is currently doing a site wide giveaway called Aurorae's Gratitude Giveaway where they are giving away a plethora of yoga and wellness products. We are helping spread the word by giving away just a few of those products here on our blog! So, what will be in your gift package from Aurorae? First off, you can't comfortably practice yoga with out a great mat! 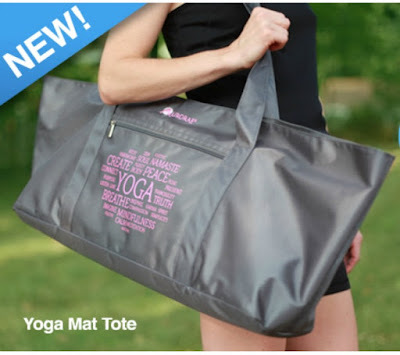 Of course you will need a Yoga tote bag for your mat and other fitness accessories. This bag is quite large and would make a great "carry on" for your next Race-cation! 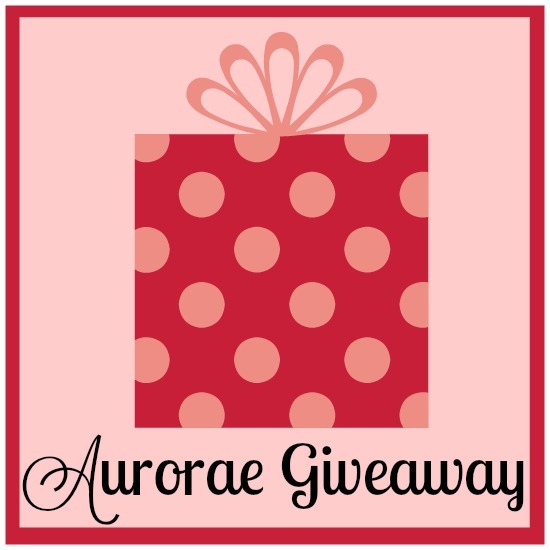 One of my favorite items in this giveaway is the Aurorae microfiber towel! Whether you are going to use it for yoga, swimming, bathing, or a day at the beach, this will probably be the softest towel you own. Since it's microfiber it would be great to put over your car seat to absorb the sweat from a long run or hot workout! This is an extra large towel (32"x68") and can be used as a pool or beach blanket. Don't ever under estimate the power of a great big soft towel! If you are reading this post, then that means you are a blogging friend of ours. 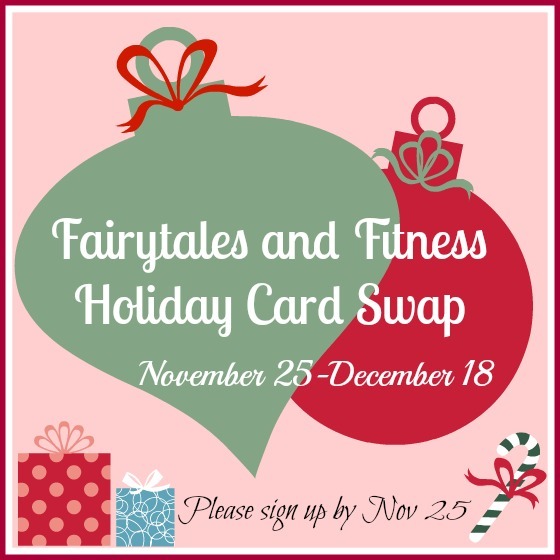 We'd love for you to increase your circle of blogging friends this Holiday season and that is why we are hosting another Holiday Card Swap. We hosted this for the first time last year and were overjoyed at how many people wanted to join us! Bloggers really are great! 1. Sign up: Please let us know that you would like to participate by leaving us a private message on our Facebook Page Fairytales and Fitness or by emailing us at fairytalesandfitness at gmail dot com. Please include your name (and name of your blog) and mailing address. 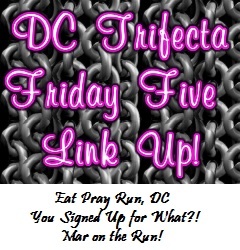 (Please note your mailing address will only be shared with us Meranda and Lacey, and one other blogger). Please sign up by Wednesday November 25. 2. 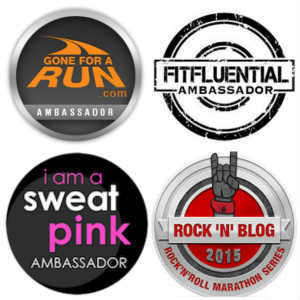 By Friday November 27,each blogger who participates will get the name and address of another blogger. You would then send that blogger a holiday card. You are encouraged to send "a little something" with your card. It might be a coupon for an item you think they would like or perhaps it's a race sticker. It could be anything really, but please make sure it fits inside the card. We don't want you to have to use any more then one stamp to send it! The "little something" inside the card is just that, a LITTLE something. I know some people got some really great somethings last year. People are really creative! If you want to know how we determined the swap list last year you can click HERE. 3. Once you get the name of your "secret blogger" you are encourage to visit their blog ( if you aren't already reading it of course). 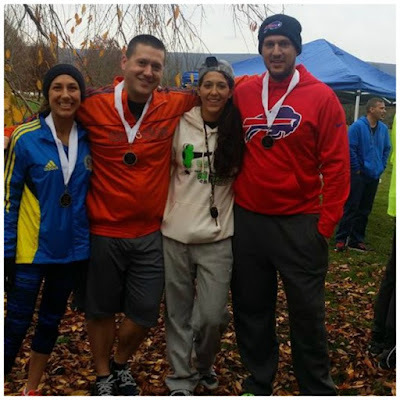 You might find that they are training for an upcoming race or maybe they are having a tough time with something and your encouraging words will be just what they need this holiday season. This way you get to know a little bit more of who they are and what they enjoy. It is up to you as to whether or not you want to keep your "Secret blogger" a secret. 5. Mail out your Card. Holiday cards should be mailed out between Nov 27 and Dec 18. This way we get it all in before the Holiday rush of that last week before Christmas. And remember, once you get your card, mention it and the sender in a blog post! Here are a few blog posts I could find from bloggers who participated in the Card Swap last year. There are many more but these are just the ones I could find with a quick Google search. 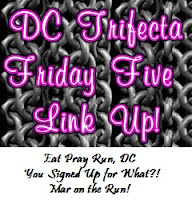 Also, thanks to the gals from the Friday 5 for the Friday link -up. 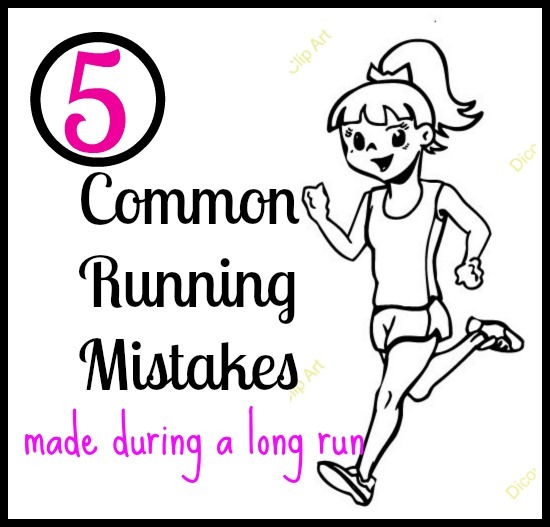 We have several (non-race) runs that have become memorable for us such as running along side Niagara Falls, running on the beach, or even running the jogging path at Disney. But what about those every day nothing special training runs that you do in your own town, have any of them ever been memorable for you? 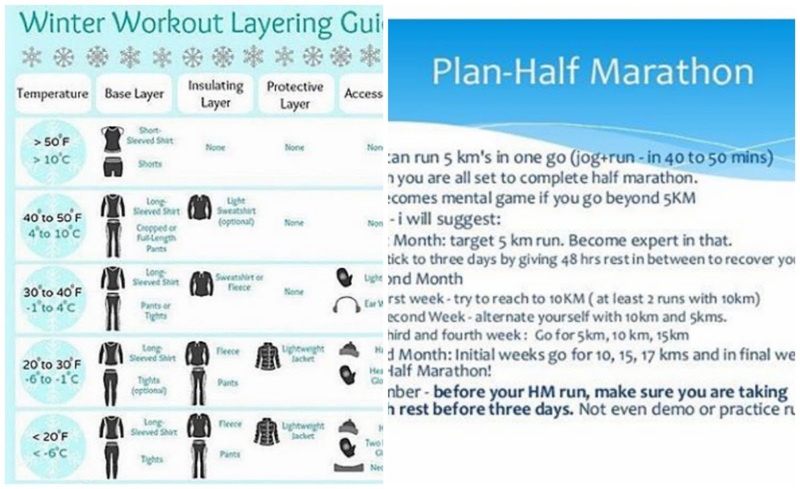 I was thinking about this the other day because I was comparing this marathon training cycle to last year's cycle and it actually put a smile to my face. There was one training run that I will never forget. In fact, it makes me smile when I think about it. It was December and the trail was covered in snow. That's right, it was covered in snow but I came to run and that's what I did. I did 22 miles that day. I started when it was day light and ended in the dark. During that run I took in the beauty of the winter wonderland I was running through, lost one of my running gloves, almost chipped a tooth on a Honey Stinger Waffle that was frozen, made an emergency pit stop at Sheetz, and almost got bit in the ankle by a Jack Russell dog that decided to run along side of me between my feet for about half a mile. I was so glad to be done with that run but now looking back I can say I thoroughly enjoyed that 4 hours on the trail all by myself. In that time I only saw one other person. It was like 30 degrees so yea, why would anybody else want to be out there? If you're interested, you can read more about that run HERE. Another ordinary training run that turned into a fun memory was when my sister and I combined a virtual race with a scavenger hunt. This was another December run (2013). We had both signed up for the Reindeer Racer virtual 5k through U.S Road Runners. We got dressed up in festive running gear and did a 5k around town. What made it special is that while we were finishing up the Holiday Scavenger hunt sponsored by #RunChat, it started to snow. There was something special about running through town while it snowed, taking pictures of Christmas ornaments and admiring Christmas lights all while listening to Christmas music! It was a totally festive run. You can read more about that run HERE. One last ordinary training run that I will never forget happened in June, 2013. I was getting miles in for the Boston Remembrance run. I was running with my dad and we did a portion of our run through a wooded path on the Island park where we would usually go to run or ride bike. 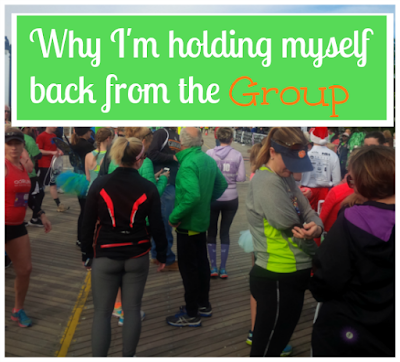 When we finished the run we walked back to the parking lot and each went our separate ways to go home. Before I got in my car to go home I re-calculated my miles and noticed I was a little off and needed to get a little more in to complete the virtual race. Because I was by myself now I didn't want to run on the wooded path, so I just stayed on the inner trail around the soccer fields. I only got half way around the path and right in the middle of it was a large deer. I was shocked! I thought the deer would be frightened of me and run away. Instead, it went back up on its hind legs and snorted at me. Yes, I was terrified! I talked about this run for months. This is one I won't ever forget either. You can read more about that particularly scary run HERE. In addition to my long runs on the weekend, I do one short run during the week. 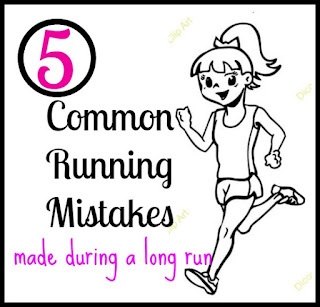 That run usually occurs on Wednesdays. 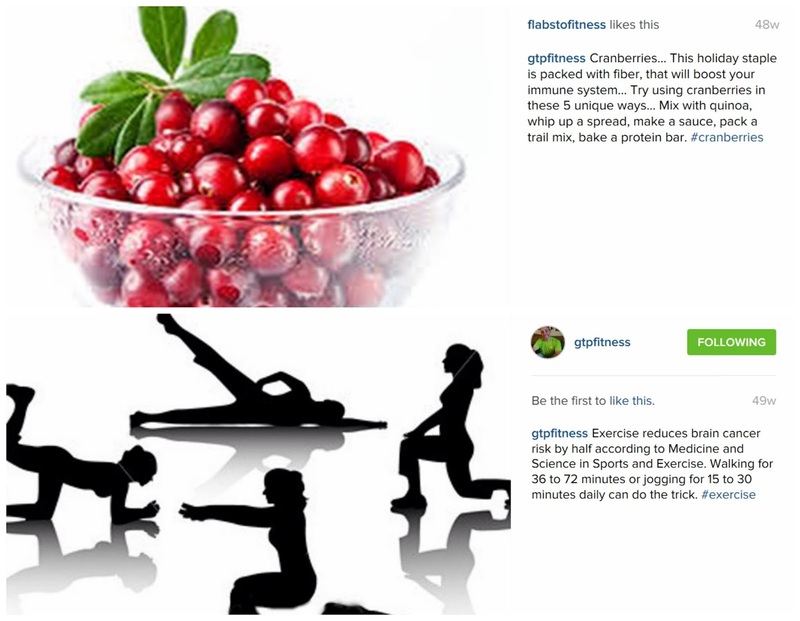 This past Wednesday I went to the gym and then planned to do a short run afterwards. I was a bit excited for this run because I was actually going to run in town like I use to. To make things even better the weather was BEAUTIFUL. It was a Wednesday evening in November and it was HOT! This is the park across from the gym where I started my run. I left my car parked at the gym and started right from there. I started running down the Main street. Boy it felt so good to run on the sidewalk. Because I do so much trail running, I hadn't ran on the sidewalks in such a long time. It reminded me of all the "good" runs I use to have. My plan was to run downtown and across the big bridge and down to the park (big decline), do two laps around the park, and then run back up over the bridge (big incline), through town, and back to my car which was parked at the gym. I felt so good running on the sidewalk that I ran the entire first mile without my intervals. About a mile and a half into the run I worried that I might not make it back into town before it got too dark. There are street lights in town and over the bridge, but not at the park. I was worried that I might not have gaged my time correctly since the whole time change thing last week. For this reason I only decided to do 3.1 miles. As I came back into town I ran the last mile in its entirety as well. Even though it was only 3.1 miles, it was a great mid week run! THEN..... the next day my calves hurt like crazy! I only did 3.1 miles, how could this be? This was my first run since my 18 miler the weekend before and I don't remember my calves hurting that bad even then. Then I realized, I bet it was the darn incline up over the bridge that I ran twice. 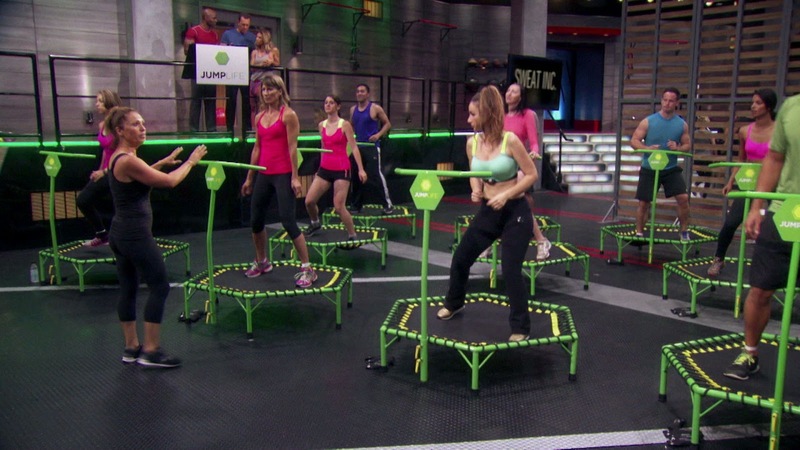 All my training runs have been on flat surfaces. Yes, I know I am doing myself a dis-service by only training on flat land and not doing hill work. I guess I will have to work on that. I wanted to mention some other things about my 18 mile run this past weekend but I didn't want to make the initial post longer than it already was, so here goes! 1. Even though I said I was feeling good, the run was NOT easy. My injury did not return but my legs felt heavy and tired and tight. After I had reached 13.1 miles, I stopped twice to bend over and kind of stretch out. It even took too much effort for me to bend over. 2. I did NOT bring enough water with me on the run. This usually isn't an issue because I usually have Scott riding his bike next to me with a large water bottle. I don't know what I was thinking only carrying my little hand held one that probably only holds 8-10 ounces. When I take this on long runs I usually run out of water by mile 9. When I saw I was getting low I REALLY tried to conserve. I thought there was a water fountain at the rest station where the restrooms were but suprisingly there was not. I'm pretty sure my water supply was depleted by mile 14. At one point I saw a man power washing a building. Had I known he didn't have cleaning solution in his sprayer I would have asked him to fill up my bottle. #RunnersWillDoAnything. 3. I did not stretch when I was done with the 18 miles. I ran right to the port o potty at the end of the trail. Second order of business was getting a bottle of water out of my trunk. I am SO glad that I remembered I had a case of water in there. 4. This training cycle I have been very conscientious of fueling properly after a run. I make sure that I get enough liquids and protein. Well, it just didn't happen after the 18 miles. I had one clif block right when I got back to my car and that was it for a few hours. I was done with my run by 2:30pm but had to run errands (I could barely get through the grocery store. I only needed 2 items but got a cart so I could have something to lean on). I did have about half a bag of chex mix but didn't have anything substantial till 5:30pm. Not quite how I should have refueled after such a long run. 5. When I got home I jumped right in the shower and then started preparing dinner for my guests that would be coming. I should have spent this time relaxing, icing, foam rolling, or putting my legs and feet in my calf massager. Nope, none of this happened! 18 miles was my longest training run this cycle and the recovery for it was a #Fail. I know this is partially why my injury keeps coming back. I KNOW I need to do better. It's just sometimes life gets in the way but I know that can't be an excuse when you are taking marathon training as seriously as I have been. 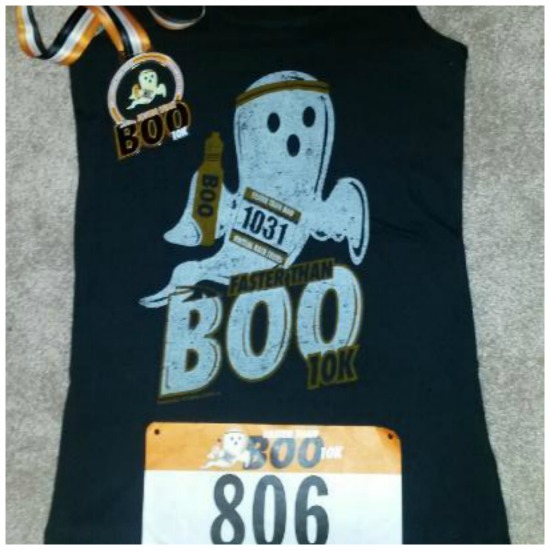 Earlier this month I signed up to participate in another Gone For A Run Virtual Race, the Faster Than Boo 10k. I'm sure you've heard of it by now, right? I have been pretty busy lately maintaining my higher mileage for my upcoming 50k, that I have been neglecting shorter runs and speed work. Since Halloween was this weekend, I knew I needed to get my virtual run in. 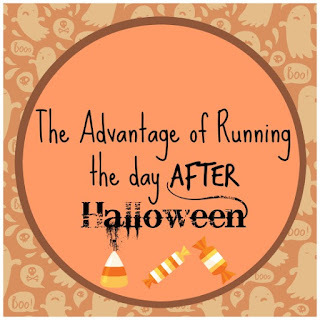 Lately when I have been going out for runs, I don't anticipate going as long as I do, so I don't properly hydrate and fuel the way I should. So this run I knew that I had to get at least 6.2 miles in and was going to continue to run if it felt good. I made sure I took water and a few gummy bears with me. 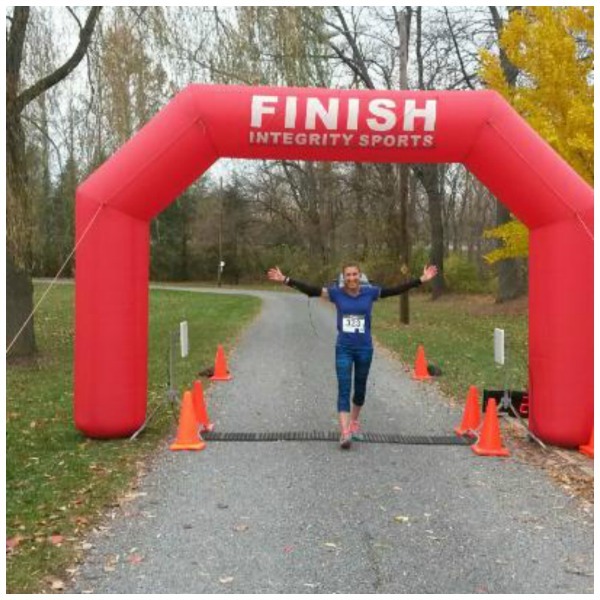 I did this Faster than Boo 10K race the day after Halloween. For all the days I didn't bring anything with me and wish I would have, this could have been the day. As I was running I noticed there was so much candy left along the side walks in town. There were smarties, laffy taffy, and bubble gum. 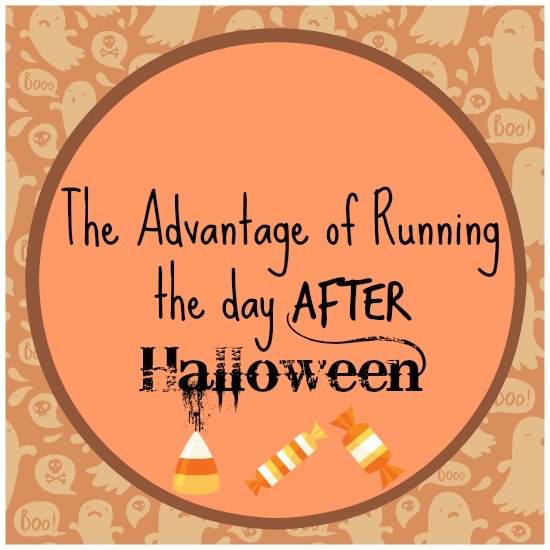 Doesn't a runner love the sugar? I continued on my way and it wasn't until I saw a Frozen theme pack of gummies that stopped me in my tracks! After all, it wasn't open, and I have been training with gummies, why not? I decided to eat them half way through my run and felt just fine. Towards the end of my run I found a pack of pretzels. Between the sweetness of GUs and Gatorade I consume during my long runs, sometimes I crave the saltiness of something such a pretzels, so I picked those up too! I had reached the 6.2 mark but had a bit further to go to make it home. I ended up with a total of 8 miles and a few snacks. I wanted to tell my sister about my run, but I thought the first thing she would say would be, Gross, you picked up candy on the street and ate it? So I just kept it to myself, until we were discussing our runs that evening and I ended up telling her. She thought it was hilarious! I just tried to think of it as a scenerio. If you were out for a long run and you didn't have anything else and that was your only option, would you? I'm sure people have picked up things along races to use such as sweatshirts and gloves (I've done that too). I suppose food is a little different since we consume it. Are you a risk taker and would try that? Or would you say no way José and keep moving along? 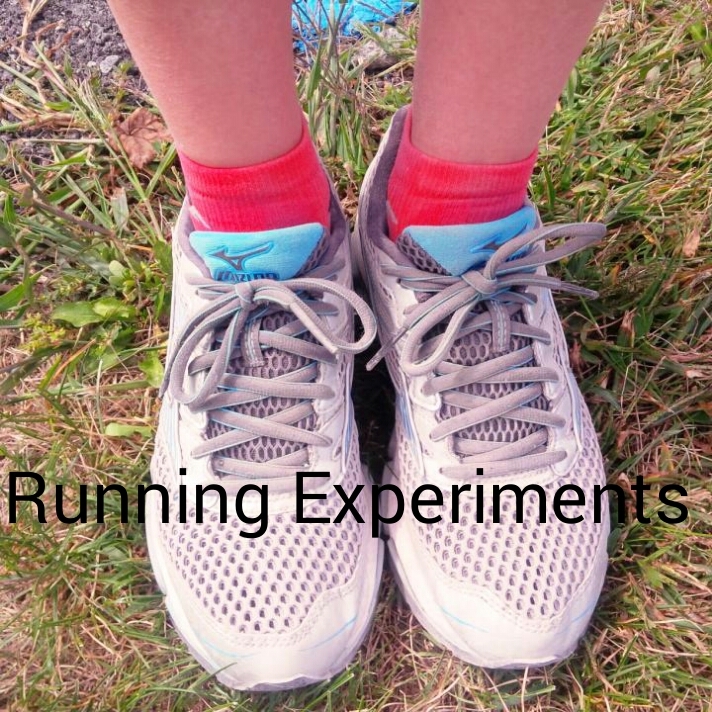 We are all runner and have our on quirks, right? I love this Halloween tank and wanted to wear it for the class spin class I taught on Saturday but silly me ended up forgetting about it. Next year I guess! I was on my own for my long run this weekend. I did 13.1 miles last weekend and was debating weather I wanted to go back down to only doing 10 miles or ramp it up and do 15 miles. I decided to just see how I was feeling during the run and then make that decision. Some very dusty Mizunos after many miles on the trail. 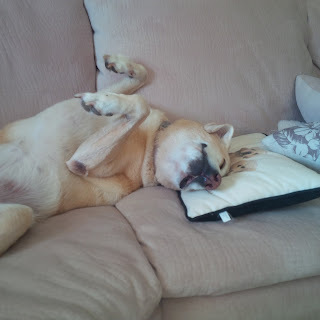 Earlier in the morning I was listening to The John Tesh Radio show and he was doing a segment on pets. I was intrigued. I usually like listening to John Tesh, he's pretty smart! Anyway, Once I got to the trail I thought I would continue listening to the radio on my ipod instead of my normal running playlist. 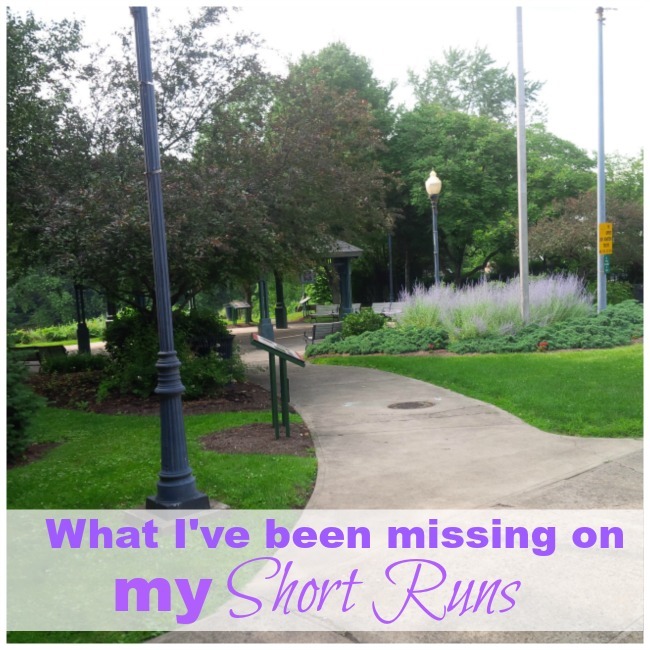 Well, between all the talking of the radio show and the commercials, I felt like I was running slower. I really do think that I need constant music to keep me going. I don't really know if it makes me run faster or if it just makes me FEEL faster because the music is fast. So, at mile 3.1 I had had enough of the radio and switched my ipod back over to my running playlist. 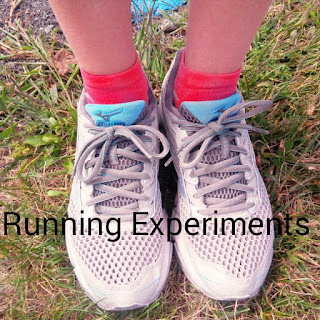 I wanted to see if the music made me run faster or if it was all in my head. I made sure to watch my time as I approached the next 3.1 miles. Sure enough I did a negative split at the 10K mark. It wasn't by much, but it was faster than the first 3.1 miles so I guess I proved my case. For now anyway! At this point I decided to go ahead and just run the 15 miles. The next experiment I was going to try was stopping at the restroom along the trail. 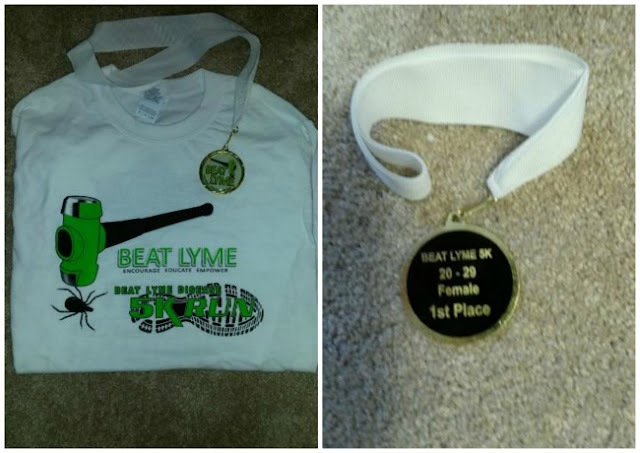 I was not in any dire need at this point but I still thought it might be good for me to start building in that extra time into my training because I know I will not be able to get through all 26.2 miles on race day without making that dreaded stop. But as it turned out by the time I approached the restroom stop I was too much in a groove to stop. The trail I usually run on is an 18 mile trail. It's 9 miles up and 9 miles back. My plan for the 15 miler was to do 7.5 up and then turn around and do the 7.5 back. It was a beautiful day out, the weather was gorgeous so I thought I might as well run up to the 8 mile mark and turn around and then that way I would finish a mile earlier. I like running a little further on the way up so I finish a bit earlier on the way back. Now in my mind I was thinking If I'm going to run 8 miles, I might as well run 9 miles and just finish up the trail. I debated about this tactic for a few minutes. It was a perfect day weather wise to get a long run of 18 miles in. It would be great to get this long run over with while I'm in the mood but on the other hand, I didn't want to get greedy with my mileage. Going from 13.1 one week to 18 the next week is a significant jump. I didn't want to risk bringing my injury back. But then it happened. In my mind it was only one more mile up and one more mile back than I was running anyway, so I decided to give the 18 miles a try. This is awful to say but I truly thought that my pain would come back and I would have to walk a lot of it anyway. But thankfully the pain stayed away. I kept thinking to myself just get through the planned 15 miles and if you have to walk the last three, you can. But when I completed the planned 15, I couldn't just give up and walk. I had to respect the last 3 miles and give it just as much effort as I did the first 15. Of course my pace was slower those last 3 miles but the overall pace was still under where I want to be for marathon weekend to make my goal. With that being said, I realize that I do need to adjust my goal for marathon weekend. I think it's possible that I will be able to run the 26 miles with in my time goal but it's that dang .2 that's going to put me over. Now I know why everyone says it's the .2 that kills ya!